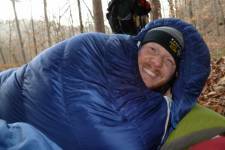 I love backpacking! However, with only two years under my belt so far, I would still consider myself a little green to it all, so to say� Initially, I started out with heavy gear but since then I have gone lighter, although I still use a little of it all. I have gone from tent to tarp, canister stove to alcohol stove, sleeping bag to quilt and quite happily from synthetic to down. All of my hiking so far has been in the South East United States, and up to this point has been with friends or family. 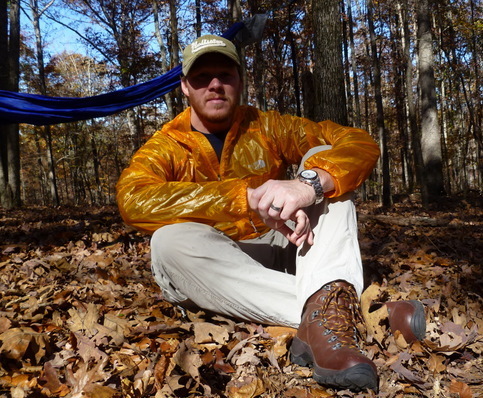 The Wolverine Fulcrum Boots (hereafter referred to as said name or simply as the "boots") are one of the models in Wolverines' "Hiking" category. According to Wolverine, these mid-height boots have been built with an aggressive sole and a full-grain leather upper to provide a rugged and durable outer. On the inside, Wolverine uses their patented ICS technology (an adjustable gel disc) which focuses on a more comfortable, and personal step. The organic inner liner provides additional arch support as well as naturally reduces odor and wicks away sweat. Then once the liner wicks the sweat away, the GORE-TEX liner will allow moisture to pass through the boot, and ultimately, help maintain dry feet. The Wolverine Fulcrum boots shipped inside a solid white shoe box with the model and size hand written on one side of the box. Inside the box, each boot was wrapped inside a plastic bag and had paper wadded up inside the boot. There were no tags or anything attached to the boots, however, there was an 8 page booklet with information on Wolverine's ICS system included inside the box. The booklet goes over the different settings found on the disc and describes which setting is best for certain gaits or comfort levels. Looking over the outside of the boots, the uppers are made up of 6 different pieces. The boots feature a gusseted tongue and there are 7 pairs of closed eyelets in which the laces are laced through. 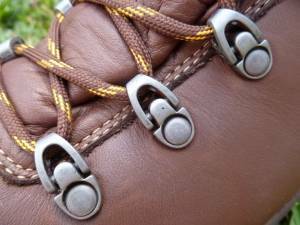 The bottom 4 pairs of eyelets are actually on a swivel whereas the top 3 are fixed. The laces are brown in color with a yellow stripe that wraps around the lace like a candy cane. There is a black heel guard across the back of the boot with "Wolverine ICS" printed in yellow. The padding around the top of the boot is black on the outside and yellow inside. Finally, at the bottom of the boot, the sole is glued to the uppers. Inside the boots, the removable inner liner is dark gray in color and again has "Wolverine ICS" along with "OrthoLite" and "Performance Arch" printed on the top. The bottom of the liner is a lighter gray color and appears to be open cell foam. As well, where the ball of the foot lands, there is a blue area (almost triangular in shape) which feels to be slightly firmer feeling than the gray area. Beneath the inner liner is a black tray that the ICS disc fits in. The tray has an indention with an arrow on it to indicate which position the ICS disc is in. Then there is the ICS disc itself. The disc itself is clear and has a hard, red wavy disc sandwiched inside. On the top of the disc is an "L" or an "R" printed right in the center (to distinguish between left and right) and a circular arrow (pointing counter clockwise on the left disc and clockwise on the right disc). As on a clock face, the word "Firm" is printed on the narrowest edge (6 o'clock) and "Cushion" is printed on the thickest edge (12 o'clock). As well, there is an "O" printed at 3 o'clock and an "I" at the 9 o'clock. 1. 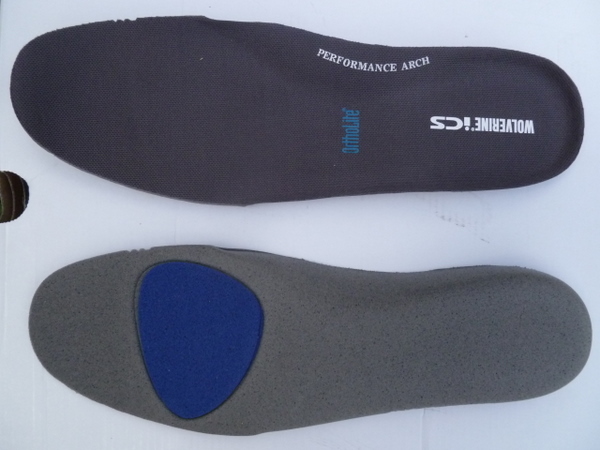 Lift insole and remove disc. 2. Rotate disc to your comfort settings. 3. Set disc and replace insole. Cushion: A cushioned heel helps reduce pressure and maximize shock absorption. Wolverine ICS is shown to provide an increase in cushioning when on the "Cushion" setting. * For an extra boost, set the disc to "Cushion". Inward (I): If you have low arches or "flat feet," inward stabilization helps reduce discomfort caused by the twisting of the foot due to over-pronation. Wolverine ICS technology is shown to enhance your gait, with an increase to inward stabilization when the disc is rotated to "I". * Set the disc to "I" if your shoes wear excessively on the inner edges. Outward (O): If you have high arches , outward stabilization helps reduce stress on your foot due to under-pronation (supination). Wolverine ICS technology is shown to enhance your gait, with an increase in outward stabilization when the disc is rotated to "O". * Set the disc to "O" if your shoes normally wear excessively on the outer edges. Firm: A firmer heel helps return energy and keeps your foot effortlessly moving forward. When set to "Firm", Wolverine ICS is shown to provide more energy return compared to other leading brands. * To combat fatigue, set the disc to "Firm". Upon initial inspection, the boots appear cosmetically pleasing. The stitching is straight and I find none that is frayed or loose. The sole appears to be glued uniformly all around the perimeter and there are no glue smudges. The eyelets appear to be functioning well and show no signs of potential problems. However, there is one little spot on the inside of the toe box on the right boot that appears to have been covered up (as seen in the picture to the right). I am not really sure what happened, but I will keep an eye on this spot throughout the test phase, both for premature wear on the outer as well as any signs of leaking in this area. The boot feels to fit slightly larger in the toe box than other boots I have worn in this size (which is my normal size). There is not any extra padding in the toe box and I assume this may be why they feel a little roomier. However, now that the temperature will be dropping I will be wearing slightly thicker socks than I have been wearing, so the extra room should accommodate these well. At this point, just wearing the boots around town with the thicker socks has not raised any issues. But, here again, I will keep an eye on this to see if it causes any problems (blisters?) while on the trail. On the topic of laces, like I mentioned in the beginning of this report, all of the eyelets on the Wolverine Fulcrum boots are closed. On all of my other boots, the top few eyelets are opened which allows the boots to easily be unlaced (this allows the top of the boots to be opened up good and wide and makes sliding the boots on and off easier). Since all of the eyelets on the Wolverine Fulcrum boots are closed, opening the top of these boots is not as easy as compared to my other boots. Although, the laces on the Wolverine Fulcrum boots will slide fairly easy through the eyelets, so with some effort the boots can be pulled open. As well, (because of the closed eyelets) I find it funny that there is not a loop on the back of the heel on the Wolverine Fulcrum boots to assist in pulling the boots on. At this point, due to the closed eyelets and the lack of a heel loop, I have found that it is a little more difficult to pull these boots on or off than it has been with my other boots. The ICS disc was the most interesting concept to me concerning these boots. 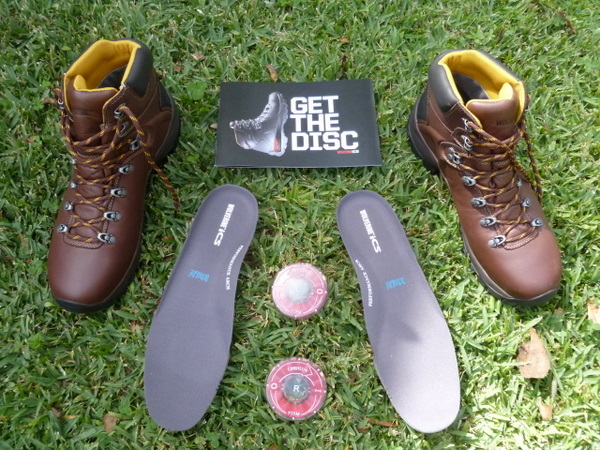 I have worn the boots with the disc in all 4 of the positions and have found that I prefer the "Cushion" setting best. I have a normal arch and am a normal pronator so I did not think I would need the "I" or the "O" settings, however, I did try them out for a while. My only concern about the disc is its lifespan. In the past I have used gel inserts inside boots and have gotten around 150 - 200 mi (242 - 322 km) on them before needing replaced. (I do understand that these are not the same thing though.) So, I will try to contact Wolverine and get a little more information on the gel disc and its expected life span, as well as what can be done once it has reached the end of its life. 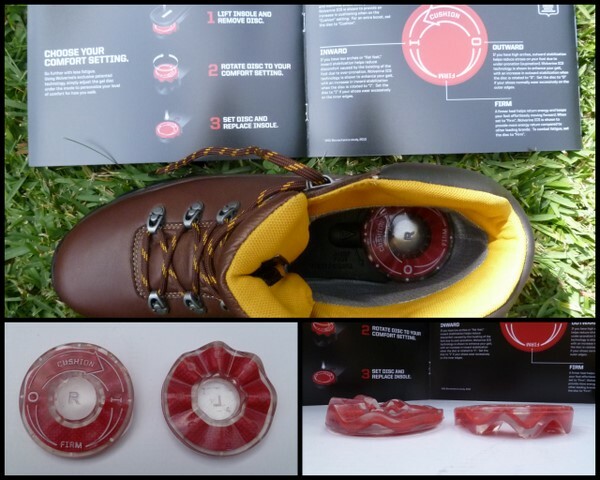 I have tried wearing the boots without the gel disc and it was not ideal in my opinion, so it is a necessity that the disc be inserted while wearing the boots. I have also noticed that the black tray in which the disc sits in creates a bit of arch support. Even though I have a normal arch, I have not found this to be uncomfortable. However, just as with the disc, this tray needs to be left inside the boots while wearing due to comfort and fit. There is a deep dip in the heel area inside the boots where the tray sits into. Without the tray, I have found that the boots are very uncomfortable and unnatural feeling. As well, due to the deep dip, without the tray there is too much volume for my feet to fill, even when tightening the laces down. 2. Minimal stitches and large pieces of full-grain leather uppers. 3. Large lugs on bottom of boots. 1. Worn area on right boot. 2. Slightly roomier than normal. 3. Top of boots cause a bit of shin pain. 4. Closed eyelets used all the way up the boot. 7. Life span of gel disc. I am looking forward to getting these boots out and getting them wet and dirty. Please check back in a couple of months to see how they are breaking in. Most of my hikes took place in dry conditions, however, two of the hikes were early morning hikes and I ended up hiking through some wet grass and brush along the sides of the trail. The trails have consisted of hard packed dirt, which sometimes consisted of rocks or protruding roots, although, considering the time of year, much of the trail is also covered in a nice soft bed of fallen leaves. Temperatures have ranged from around 35 to 85 F (1 to 29 C). The elevation at Big Hill Pond State park ranges from 380 to 611 ft (116 to 186 m), so there is little elevation change. 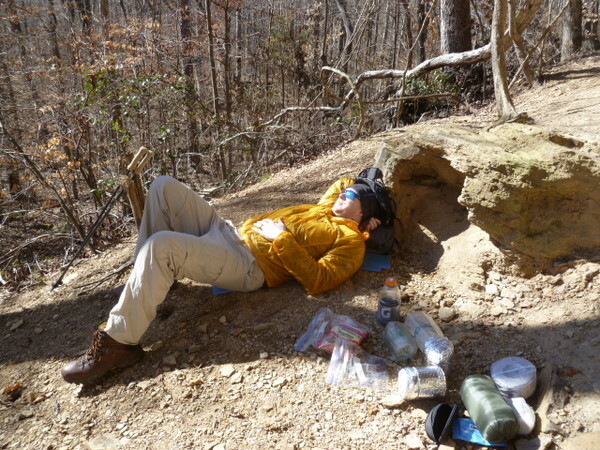 My pack weight on my day hikes were between 6 to 10 lbs (2.7 to 4.5 kg) and 23 lbs (10.4 kg) during my overnight trip. 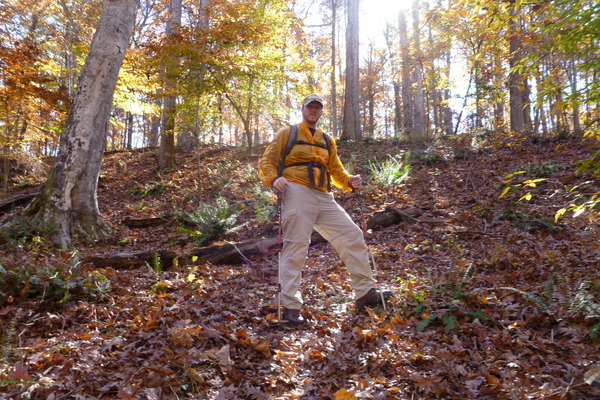 During each of these hikes I wore the same brand of medium-weight, mid-calf wool hiking socks with the boots. As well, due to our current parking conditions at my work, we have about a 0.25 mi (0.4 km) walk from the parking area to the building I work in which I walk twice a day, five days a week (or more). Much of the walk is on concrete, but about a third of the walk is on gravel and hard packed dirt. Temperatures have ranged between 26 to 90 F (-3 to 32 C). The conditions have ranged from small amounts of snow, to large amounts of rain to warm, dry days. My biggest concern when receiving the boots was the rough spot on the inside of the toe box on the right boot and so far all is well. Neither the spot, nor the area around the spot, seems to have worsened or to be evolving into anything that is worth worrying about. However, I will be sure to keep an eye on this spot throughout the rest of the testing series. Since most of my hikes have been rather short hikes, the boots have at this point been successfully broken in. 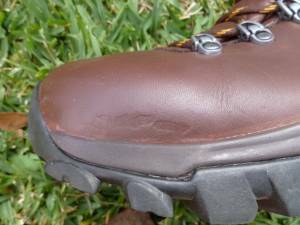 Both the soles and the top of the boots were a little stiff upon my initial impression, but after only a week or two of moderate use, both the soles and the top of the boots felt to be a bit less firm and more comfortable. (Actually, I was a bit surprised that it only took the limited amount of use to break the boots in as well as they feel that they are!) Also, with use the laces have started nesting just below the top of the tongue, causing the top of the tongue to flare out slightly, which has also increased the comfort. As well, the laces have done a great job at holding tight. Even on my longer hike during this time period, I never once had to stop and retie the laces! I initially had a bit of concern about the amount of room in the toe box, but like I mentioned in the initial report, I have been wearing some medium-weight wool socks and so far the amount of room has not been a problem at all. Actually, since "breaking them in" the boots have been very, very comfortable. Of course, the longest hike I have used these boots on was only 9 mi (14.5 km), and that was on pretty easy terrain, but not once did I feel a hint of a hot spot. However, during the next phase of this testing series I have a longer multi-day hike planned so I should see how they do better then. Concerning the ICS disc, being that I have a normal arch and am a normal pronator I have only worn the boots with the disc in the "Firm" setting and the "Cushion" setting. However, I quickly decided that the "firm" setting was too firm for my liking and changed the disc setting back to "Cushion." 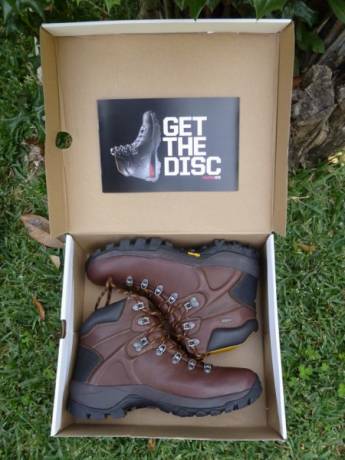 I have found that I am really happy with the fit and comfort of wearing these boots with the disc in the "Cushion" setting. The remainder of my testing will more than likely be done in this setting. I have not had any issues with water coming into the boots and while most of my trail time has been on dry trail, I have done my share of puddle stomping with them on and have walked away with warm, dry feet! As well, the boots have proven to be quite warm while wearing my wool socks in temperatures as low as 26 F (-3 C). Even though the boots have softened up and have been broken in, getting the boots on and off is still a little harder that I would like. I still wish that Wolverine had incorporated either the open-eyelets at the top of the boots or the heel strap at the back. With some of my other boots that has open-eyelets at the top, I can almost jump right into them from inside my tent, or hammock, but with these there is a bit of fiddle factor to consider. The best option that I can come up with these so far is to simply pull hard on my laces when removing the boots so that the top will open up as much as possible. The only other real hang-up I have with these boots is the weight. Simply put, these boots are heavy! By far, these are the heaviest boots I have worn, and I can tell it with each step, and so far I can't say that I have really gotten used to the weight. 4. No hot spots (so far). 5. Keeps my feet dry. 6. Keeps my feet warm. 1. Rough spot on the inside of the toe box on the right boot. 2. Hard to put on or remove boots due to lack of open-eyelets or a heels loop. 3. These boots are heavy. So, I will take these boots with me on my travels during the next 2 months. So be sure to check back near the end of February to see how the boots have treated me during this time. Over the past 2 months I have worn these boots on another 44 mi (71 km) of trail hiking, which included a four-day hike as well as 2 more single day hikes. I spent four days hiking along a 35 mi (56 km) section of the Appalachian Trail (AT) in north Georgia. The trail through this area is a mixture of hard packed dirt with both rocks and roots jutting out of the ground. As well, some areas of the trail are simply large sections of flat, smooth rock, and at times, even a bit of a rock scramble. At higher elevations we also encountered some icy patches along the trail. Elevations were constantly up and down, and ranged between 2,500 to 4,500 ft (762 to 1,372 m). Temperatures ranged from about 16 to 40 F (-9 to 4 C). Conditions were everything from windy, rainy, sleeting and even a little snow. My total pack weight starting out on this trip was 17 lb (7.7 kg). I also did another smaller 7 mi (11 km) solo day hike at Big Hill Pond State Park. The conditions were much the same as mentioned above in my field report section: hard packed ground with some rocks and roots jutting out of the ground, however, a worn layer of fallen leaves softened the trail a bit. Elevation in the park ranges from 380 to 611 ft (116 to 186 m) and the temperature on this hike was around 50 F (10 C). My day pack on this hike was 8 lb (3.6 kg). The last hike that I wore these boots on was on a short, quick 3 mi (1.3 km) hike in Tishomingo State Park with my children. The trail in this area is also hard packed ground with some rocks and roots jutting out, however, there are frequent areas with small loose rocks. As well, there are also a few areas that are actually somewhat of a rock climb. The general elevation at the park is about 518 ft (158 m) and there is little change either way. The temperature was around 50 F (10 C) and the skies were nice and clear. My day pack on this trip was about 10 lb (4.5 kg). My four-day hike was definitely an eye opener with these boots. The terrain was both rougher and much steeper on this hike than on the previous hikes/trails that I have worn the boots on. As well, my mileages each day while on this hike were more than the daily mileages from most of my other hikes with these boots. This hike definitely gave me more insight as to how these boots performed for me on a more strenuous hike. What I found is that these boots do not work on my feet, at least on what I consider to be moderate to strenuous hiking trails. After the four day hike I came home with a small blister on the back of each of my heels, as well as a deep blister on the bottom of my right big toe. I started developing the blisters on the morning of the second day of hiking. Each day I had hoped that they would not exacerbate, but they did. Thanks to these boots I found each step I took in the upward direction painful and looked forward to making it to camp each night just so I could take the boots off. The problem was that my heel kept lifting out of the heel cup each time I would step, and this allowed the back of my heel to rub against the inside of the boot. I made quite a few attempts at tightening down the laces (including locking my laces) with the hopes that my heel would be forced to stay seated in the heel cup. However, I never could get this to happen. As well, I also tried wearing a fresh pair of clean socks each day (except for on the last day, which I had to wear a washed pair). However, the socks seemed to make no difference in how the boots performed. I also tried changing the ICS disc from the "Cushion" setting (which I have always preferred) to the "Firm" setting. I did not have high hopes for this considering the "Firm" setting would make the heel cup even deeper, but thought it was worth a shot. After only about 10 minutes of hiking uphill while the ICS disc was set to "Firm" I had to stop and change the ICS disc back to the "Cushion" setting. Another thing that I continued to notice on this trip was the weight of the boots. Granted, I was aware of the heavy weight of the boots before I left out on this hike, but I really noticed it on this trip more than I have on other trips. To make the weight issue somewhat worse, I noticed that the lugs would not clean out so easily once they became plugged with mud. This made the boots quite heavy at times. However, the soles did a great job at gripping the wet rocks, and I do feel like the lugs did a great job at gripping to the near constant uneven terrain. 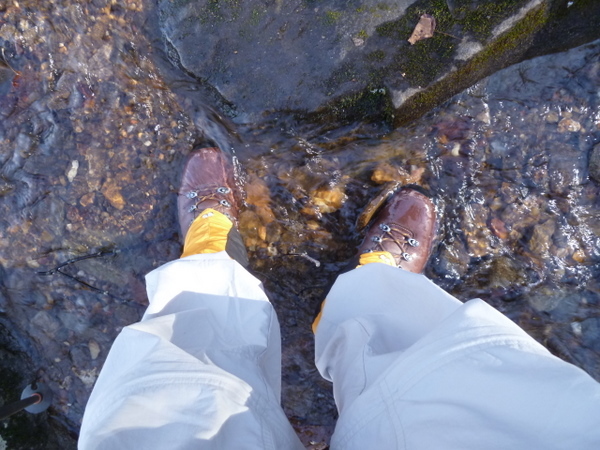 I was really happy with the traction that these boots provided on the rugged, wet and slippery terrain along the AT. The last thing that I noticed on this hike was the way that the toe box of the boots was becoming scratched up from the rocky terrain (this can be seen somewhat in an above picture). This did not cause any immediate concern, but it does give me reason to have some concern in the long run. I feel like a toe guard that wrapped over the top of the boot would be beneficial. Despite the blisters and pain that these boots caused me, I decided to take the boots out on the other two smaller day hikes, which were on more forgiving terrain. 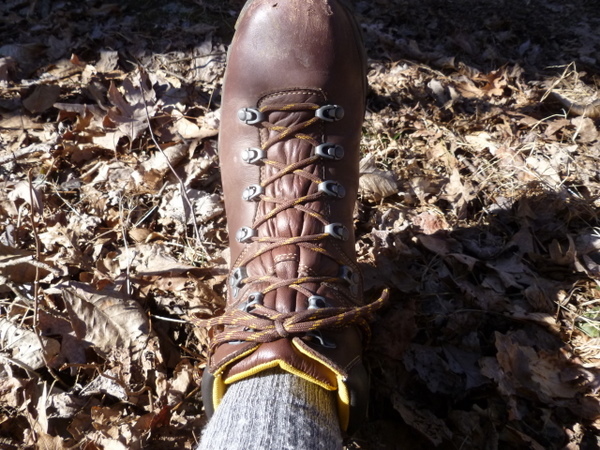 I found that here again, on easier types of terrain such as that at Big Hill Pond and Tishomingo State Park, the boots did fine and I did not experience any pain or blisters from either of these day hikes. I am still not happy with the lack of features which would make putting these boots on or taking them off easier. Especially now that I had to really tighten down on the laces to try and keep my heel seated. This only made the top opening of the boots smaller, which made it harder to remove the boots, and even more so to put them back on. I would like to see Wolverine include both the open eyelets on the top of these boots as well as a heel loop on the back of these boots. Both of these features would greatly increase the ease of putting on/removing the boots. However, I would be happy with at least one of these features rather than none. At this point I am not too happy with these boots. For me, they are fine for small, easy day hikes, but nothing more. As well, I am not making any plans to use these boots on any other sort of extended backpacking trip due to the discomfort that they have given me on my last hike. 1. Kept my feet warm. 2. Kept my feet dry. 3. Comfortable if not using them to hike in. 1. Caused pain/discomfort and blisters due to inability to keep my heels seated. 2. Hard to put on/take off due to lack of features. At this time, I would like to take this time to thank BackpackGearTest.org as well as Wolverine World Wide for giving me the opportunity to test out these boots.